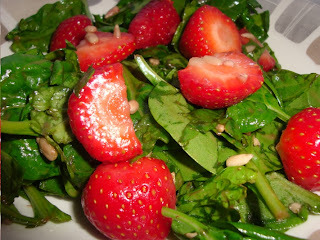 Wash the spinach, Wash & Chop the strawberries. Add to a mixing/salad bowl and toss. Squeeze the lemon and do a final toss. I was expecting it to taste a little odd but I was wrong, maybe the lemon just brought it all together nicely. Love it. This entry was posted in Eat In, Healthy Eating, Recipes on September 4, 2011 by Adura Odesanya. I’m so with you on the spinach – far tastier than limp green lettuce! Yum! yum! I’m SO doing this. Thanks for sharing.